I didn’t plan it, but on a de facto basis I’ve taken a month-long, late summer vacation from the life and times of Santa Monica. I did a little traveling, but let’s face it: with the heat it was hard to think, let alone write blogs about local politics. However, time, tide, and the Santa Monica Coalition for a Livable City (SMCLC) wait for no man, and while I was gone one of the juiciest political dramas in recent Santa Monica history kicked into high gear. I’m speaking of the fallout from the City’s firing of Elizabeth Riel in 2014 and the settling in July of her subsequent lawsuit for $710,000. Meanwhile, Mayor Kevin McKeown has said that the City will review the matter, and O’Connor has said she welcomes the review. Not willing to wait for the D.A. or the City and not considering SMCLC’s analysis to be definitive, I decided to conduct my own investigation. Through a public information request I obtained all the documents disclosed by the parties in Riel’s lawsuit and the depositions of O’Connor, Gould, Riel and Mayor Kevin McKeown. In this much longer than usual post I’ll summarize the facts as laid out in the documents and deposition testimony; in later posts I’ll try to make sense of the various issues that arise from the case. There are a lot of them: the politics, naturally, and even the philosophical, because the case has a lot to do with where government runs up against politics, but also the personal. Believe me, the personalities could be out of a novel, or a gritty TV drama. The City hired Riel on May 6, 2014, and she was going to start work on June 2. Her job was to be the City’s Communications and Public Affairs Officer. The position is within the City Manager’s office and involves, among other duties, interacting with all the city councilmembers, particularly to prepare them when they would be representing the City in public events. Riel would be replacing the estimable Kate Vernez, who was retiring. The crucial events that led to the firing of Riel took place over about 24 hours on Thursday and Friday, May 22 and 23, 2014, which were two days that preceded the Memorial Day weekend. Based on my reading of the relevant documents, principally emails among O’Connor, Gould, Gould’s staff, and Riel, and the depositions of O’Connor, Riel, and Gould, the following is the chronology of what happened. On May 22, in the late afternoon or early evening, O’Connor, who was then mayor, sends her first email to Gould. 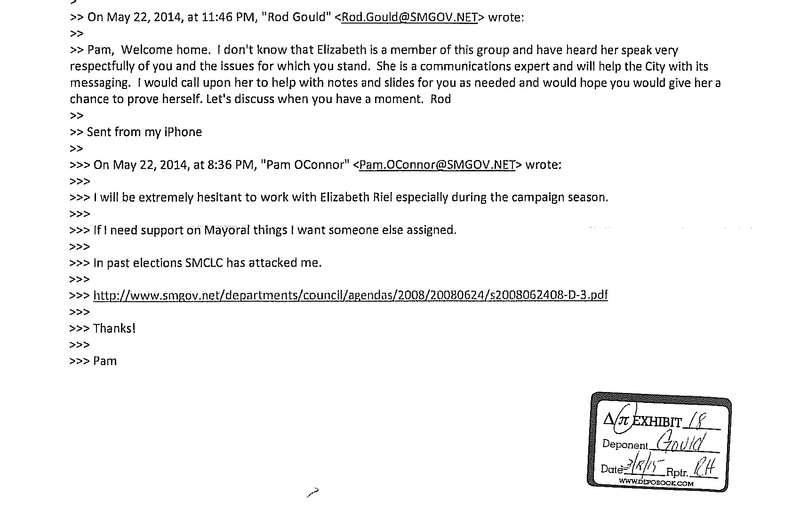 She tells Gould that she will be “extremely hesitant to work with Elizabeth Riel especially during the campaign season” and that “if I need support on Mayoral things I want someone else assigned.” Gould, by the way, is in Canada at a conference when he receives this email. He remains in Canada until Sunday, May 25; one affect of this is that, as the lawyers in the case realized, it’s often difficult to know the exact time, in Santa Monica, that emails were sent, since people are emailing from different time zones. In her first email, O’Connor doesn’t give much in the way of reasons for not wanting to work with Riel, simply saying that “in past elections SMCLC has attacked me.” “SMCLC” is, of course, a reference to the Santa Monica Coalition for a Livable City. 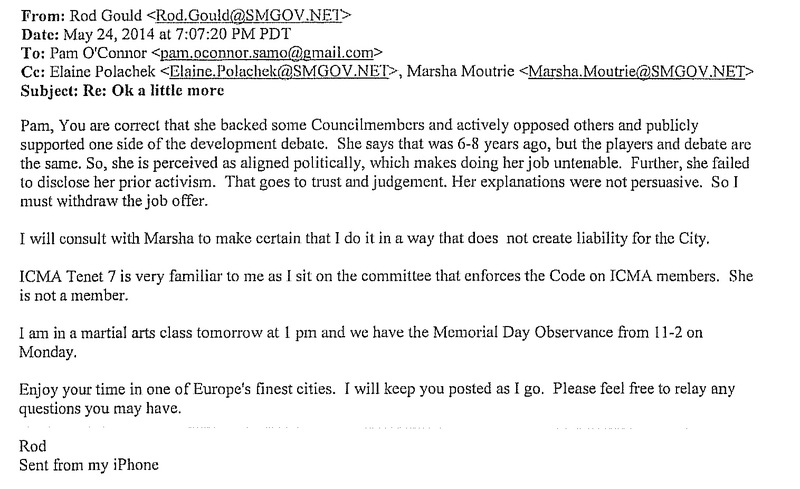 The only backup that O’Connor gives in this email for her not wanting to work with Riel is a link to a letter to the City Clerk in 2008 that Riel co-signed as of one of the proponents of SMCLC’s RIFT initiative, along with two other proponents, Diana Gordon, co-chair of SMCLC, and future councilmember Ted Winterer, who signed as President of the Ocean Park Association. Riel identified herself as “Past President, NOMA,” referring to the North of Montana Association. Pam O’Connor’s first email to Rod Gould about Elizabeth Riel, and his reply. It’s not clear that either of O’Connor’s first two emails would have had any impact on Gould, but then O’Connor sends Gould a third email. Apparently O’Connor had been doing Internet research; she begins this email by saying that “I don’t think your background checking folks did much of a job,” and then quotes from and links to an article in the Lookout from 2006 about an attack mailer that SMCLC sent out in 2006 against O’Connor that Riel helped fund. In Canada, Gould must have gone to bed by then, because he didn’t reply until the next morning, Friday, May 23, and it was on that day that the crucial developments that resulted in Riel’s firing took place. Gould responds in an email by saying that he will speak with Riel “to be sure she can work with all members of the City Council.” Crucially he then says, “I think we made the right hiring decision, but am not at all sure Pam will give her a chance to prove herself.” This is important because it shows that Gould was not then expecting to fire Riel, but was worried that O’Connor would not work with Riel when she came aboard. Nothing that O’Connor had said to that point made Gould think that the solution was to fire Riel. 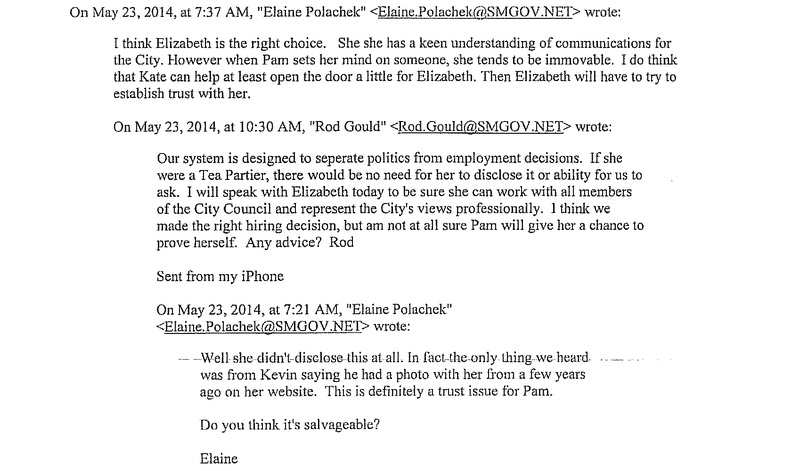 Emails between Gould and Elaine Polachek Friday morning. These emails make it clear that at this point both Gould and Polachek expected Riel to come to work, and the issue would be getting O’Connor to work with her. As Friday began, Gould was expecting to speak to Riel to confirm that she could work with all members of the Council, but he was worried that O’Connor would not give Riel the benefit of the doubt. In the email O’Connor chides Gould for hiring “people who are political enemies of people elected to your Council,” but O’Connor still considers the hiring of Riel to be a done deal. There’s nothing indicating that O’Connor believes the decision can be reversed; she wants Gould to find someone else for her to work with. But again, there’s nothing where O’Connor indicates that Riel could or should be got rid of. Emails between Gould and Elizabeth Riel trying to schedule a phone call. The delay in connecting did not help the atmosphere for the eventual telephone conversation. As the day progressed, Gould became increasingly annoyed by what Riel had not disclosed during the hiring process. His annoyance became focused on four prior political activities that seemed particularly partisan: Riel’s financial contribution to the 2006 attack mailer on O’Connor; her being an active volunteer on McKeown’s 2006 reelection campaign (and donating to it); her being one of the founding members of SMCLC; and her being one of the leaders in the 2008 RIFT campaign. Gould’s increasing frustration was reflected in two emails that he sent to O’Connor Friday afternoon before speaking to Riel. In them he first raises the possibility, if Riel can’t give him assurances that she’ll be able to work with all the councilmembers, of rescinding the job offer. (Gould always wrote as if Riel had only been offered the job, not that she’d accepted the offer and been employed). In the first email he writes, “if she insists that she can discharge the full duties of the position, then I must allow her to begin work.” He says that he will discuss the matter with City Attorney Marsha Moutrie to see what his options are; from the email it’s clear that he believed that Riel’s job was under civil service and that she might have job protections that could prevent him from terminating her employment. O’Connor apparently didn’t see this last email from Gould until the next day when she was in Barcelona. Yes, while O’Connor was writing those emails that Friday afternoon, she was preparing to fly to Spain. She doesn’t respond to this email until Saturday, the 24th, after she got off her flight in the late morning Barcelona time, which was in the wee hours Saturday morning in Santa Monica. In the meantime, it was all over but the litigating. Gould and Riel finally connected late Friday afternoon; Riel was on her cellphone doing errands in her neighborhood. The conversation did not go well. While in their depositions and in court papers Gould and Riel differ on the tone of the conversation, the content is not materially in dispute. Gould began the call by asking Riel about the four incidents of partisan political activity that most bothered him. Riel, for her part, acknowledged that the facts as Gould had them were true. You might think, so far so good, but alas, instead of this acknowledgement leading to dialogue and an understanding that restored Gould’s faith that Riel could do the job, the conversation went downhill. According to Gould, he lost faith in Riel because instead of going on from acknowledging that she’d engaged in partisan activities to a further acknowledgement that these revelations created problems, Riel gave Gould four of what he called “rationalizations.” The first was Riel’s saying, according to Gould, after she acknowledged the four partisan activities, “But I never hid it from you.” As Gould recounts in his deposition (page 239), that statement perplexed him, since she had not disclosed anything about political activities in the recruitment process. More than anything else, this statement from Riel, that she had not hidden her prior political activities from Gould, seems to have been what cost her Gould’s confidence and her job. In case you are wondering, as I am, what Riel meant by this statement, you won’t find an answer in her deposition, as the attorney for the City did not ask Riel why she told Gould that she had not hid the information. The attorney did ask her if she had disclosed the information in the recruitment process, and Riel admitted that she had not (page 278 of her deposition), and consequently it’s hard to understand what Riel was thinking when she told Gould she’d been open about her past. (Based upon something her husband said after the firing, it’s possible that Riel considered that she had disclosed enough about her political past by disclosing on her resume that she had been president of the North of Montana Association and that she had written a column for the Daily Press.) What’s unfortunate is that if, in the phone call with Gould, Riel had simply said what came out later, that after six years she’d put all of those politics out of her mind and didn’t think they were important (Riel deposition, page 74), the phone call might have had a better outcome. Gould ended the conversation by telling Riel that they should both think about the issue over the weekend and speak again, but it’s clear from emails Gould sent to O’Connor and his staff that he had made up his mind based upon the phone call Friday afternoon to rescind the job offer. Email from Gould to O’Connor, cc’ing Polachek and Moutrie, on Saturday regarding his decision to fire Riel. For her part, Riel also believed that she’d lost the job. By the next day a sympathetic friend with whom Riel had confided was trying to find her a lawyer, and by Monday (Memorial Day), when Gould gave Riel the formal decision over the phone, she, anticipating legal action, took notes on what he said. Suffice it to say that the phone call on Monday did not go well either. Gould was sad and apologetic, but his attempts to persuade Riel to agree to a joint statement, to spare her, he thought, embarrassment, only made things worse. So that’s what happened. One can argue whether Gould fired Riel because of her political beliefs or because he no longer trusted her, or no longer believed that she could act impartially in her job, and O’Connor sure didn’t want to work with Riel, but there is no evidence from the record that Gould made his decision on orders from O’Connor or even on her suggestion. Next installment—what can a councilmember say to a city manager, and what should a councilmember be able to to say to a city manager? This entry was posted in Uncategorized and tagged Elizabeth Riel, Pam O'Connor, Rod Gould, Santa Monica politics by Frank Gruber. Bookmark the permalink. 4/19 Post Independent Counsel Report: Yes Pam O’Conner most likely violated ethics rules. The very conversation she had with Ron Gould prior to the firing should never have taken place (and she should never have communicated outside of official city channels). The e-mails just add to he lack of ethics. To quote: “At best, Ms. O’Connor showed bad judgment in wording her e-mails in a way that had the foreseeable potential of influencing the City Manager’s hiring decision. At worst, Ms. O’Connor consciously and intentionally attempted to influence the City Manager’s hiring decision. In either case, Ms. O’Connor showed a failure to understand the limitations of her role as a council member in Santa Monica city government,”. While Ron Gould was not deemed to have acted inappropriately (except for engaging in the pre- firing conversations with Pam O’Conner and never informing the City Council). It was found that he could immediately hire another candidate however his judgement in doing so was questioned given the situation that was at hand. The city attorney MS. Moutrie was sited for her inability to deal with enforcement of ethics issues within the city and it was again recommended (and specific changes were presented) that her office use either internal criminal prosecutors or hire outside special prosecutors when ethics problems come to light. (not sandbag an investigation until the statute of limitations passes). I add that the very recommendations made have been in the past aggressively opposed by Ms. Moutrie. There were other operational ethics issues that need to be addressed but need not be commented on here. I think Frank, in light of the report your prior analysis was substantially wrong. Thanks for your analysis — I’ve printed the report and I hope to read it soon. I assume both Pam O’Conner and Rod Gould fully understood the employment and ethics laws they worked under. Pam O’Conner should have, as Mayor, never engaged in an ongoing conversation with Rod Gould pushing to have the women fired. Rod Gould’s first mistake was accepting the continuous stream of e-mails sent by Pam and not…upfront saying he would not entertain her seemingly frantic blitz of complaints (many off point). He should not have hired the women only to fire her the next day. His second mistake was consulting our ace Santa Monica City Attorney Marsha Moultree for advice on how to proceed to avoid city liability. She was obviously wrong given the city lost the civil suit resulting from the firing. The e-mail that you read as exculpatory can also be read (and I guess was read) as Rod Gould buckling under pressure from Pam O’Conner then looking for a reason and a course of action (in consultation with the city attorney) to justify the firing so the city wouldn’t face liability issues. As often is the case one can over analyze looking at the minutia and in doing so miss the big picture. Does the then city Mayor, Ms. O’Conner, have to literally say “fire the women” for her to have violated the law? Does the totally of the content of her e-mails along with the volume of e-mails going to the office of the city manager not speak to her intent? If I had to sit on the jury the instructions given by the judge would influence whether I thought she was guilty or innocent. Certainly not the “slam dunk” not guilty conclusion you reached. And it looks a trifle fishy, I’ll admit. And it mounted up, your Honor, bit by bit. That a little tin key unlocks. About a little tin box. All a-glitter with blue-chip stocks. Maybe, Doug, but then maybe no one would dare to work for government. Maybe Frank a city attorney who time after time shows an inability to protect the city giving City Council lousy legal advice should be terminated?